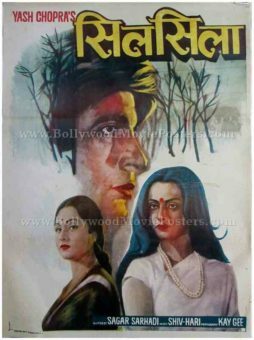 Quirky vintage hand drawn Bollywood poster of the cult Hindi film Silsila (1981) for sale. This is an actual surviving old Bollywood poster of what is regarded as one of the most romantic movies ever made in Bollywood, making it highly collectible. Printed and circulated a few years after the first release of the film, this old Amitabh movie poster was originally designed for publicity of the film but never ended up being used. This poster was originally designed on a hand painted canvas by a small time art studio in Delhi and features very quirky artwork. A large partial face of Amitabh Bachchan is seen painted on the top juxtaposed at the bottom with portraits of the two leading actress of the film, Jaya Bhaduri Bachchan and Rekha. 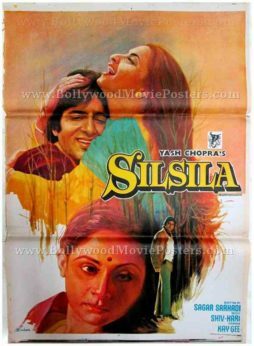 Beautiful hand painted vintage Bollywood poster of the cult Hindi film Silsila (1981) for sale. This is an actual surviving poster of what is regarded as one of the most romantic movies ever made in Bollywood. Printed and circulated somewhere during the release of the film, this hand painted vintage Bollywood movie poster was originally designed for publicity of the film but never ended up being used. This poster was originally designed on a hand painted canvas by the greatest and highest paid Bollywood movie poster artist of all time, Diwakar Karkare, making it very collectable. The poster bears the original signature of Diwakar on the bottom left corner.